Today I got my first opinion letter in the Exponent of the year. It concerned a PSG meeting (and is a response to this editorial), and can be read here. I want to say now that I am rather impressed with both presidential candidates after hearing both of their platforms on LGBTQ issues. 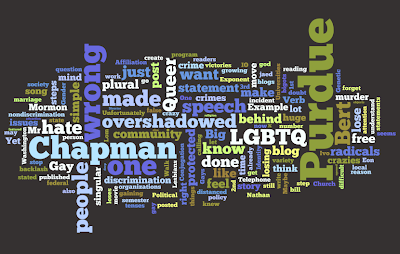 Next year could be a really good year for the LGBTQ community in Purdue Student Government. I look forward to working with whoever is elected, and feel that great progress can be made. On the 10th of February, 2010, the Purdue Student Government (PSG) voted unanimously to urge Purdue University to amend its Nondiscrimination Policy to add "Gender Identity and Expression, Genetic Information, and Political Affiliation." Today, the 1st of March 2010, the Purdue Graduate Student Government (PGSG) voted 32-0 on that same resolution. It is stunning to see such an immensely important resolution continue through the system, and to be doing so well! I honestly am amazed that the resolution has done so well. I remember going into the PSG meeting seriously worrying that the resolution would fail (and I thank those who helped me keep my sanity! ), and then we came out of it with a unanimous victory! Then, today, I was in a total state of worry again that the resolution would fail, even though we had been told the resolution should do well. My worry peaked when the bathroom issue (a typical ploy by the forces of evil to kill transgender rights) was brought up. Do these people seriously think that all but two AAU Universities and every Big Ten University except for Purdue would pass these resolutions if it risked people's safety? This issue is one of providing safety, not losing it. Luckily Jess Rombach and the various senators were more than prepared for the question. She illustrated her point flawlessly when she used her change of roommates freshman year due to climate conditions to tackle the housing issue, and was well equipped for the bathroom question. She easily quelled the worry of the two senators posing the questions. As an amusing aside, there was a several minute debate on whether the resolution should be amended to add something along the lines of "or lack thereof" with regards to religion. It was eventually decided that religion did cover the nonreligious (as the discrimination would be on religious grounds), although they may talk with certain leaders about clarifying the wording in the future. I still held my breath when the vote occurred, and was stunned, again, to see people so strongly embracing equal rights. It truly makes me feel safer at Purdue just knowing that so many of our student leaders understand just how important this resolution is. While we celebrate this victory, we also must not forget that the steps ahead are harder. Student governments move faster than the many others who will see when it comes to policy. Doubt and opposition may begin to manifest, and we have to be prepared for tougher questions and even ignorant people. I STRONGLY urge you to support this resolution. It means more than you could ever imagine to a lot of people. Media about the Purdue University Student Government Senate unanimously approving a resolution to urge Purdue University to add to its Nondiscrimination Policy: Gender Identity and Expression, Genetic Information, and Political Affiliation. I can not believe it, and it is so amazingly spectacular. The Purdue Student Government Senate has unanimously (yes, a 20-0 vote) approved a resolution urging Purdue University to amend its Nondiscrimination Policy to included Gender Identity and Expression, Genetic Information, and Political Affiliation. I thought the vote would be close and we might even lose, but no, it was unanimous and we won! This is fabulous, and while I could go on and on about why, it really comes down to inclusion. Purdue Student Government just sent a message, which is going to get media attention, that Purdue University needs to be more inclusive. I have no idea what is still to come. This issue is ultimately going to go to the Board of Trustees, and this unanimous vote is going to appear before them (and hopefully help this pass!). I know that each step will be harder, but this was a huge hurdle that was just jumped, and it is really energizing after seeing so much defeat in meetings. I truly have to commend Jessica Rombach. Her campaigning has been brilliant and she has no idea how much she has helped people. Purdue University will hopefully join the rest of the Big Ten, and the overwhelming majority of the other high ranked universities, in including Gender Identity and Expression to the Nondiscrimination Policy. Notes on the vote: The resolution came up, and a few senators spoke (nobody in opposition). There were a lot of spectators for a PSG meeting (and that did not go unnoticed). The vote was unanimous, and a huge applause followed. I teared up (had my tears of happiness a little later), and several other people did cry (and were very touched). I don't know if people know how much these few words mean to people. How much it means to some of my friends that Gender Identity and Expression may be added. How much safer they will feel. I feel safer just with the knowledge that there was support for an addition that affects a lot of other members of the Queer community. This is also a huge retention and recruitment issue. The people who know to look do, and this will really help. I will start another post tracking this issue as it develops. (Sorry this is discombobulated, and that it really only talks about Gender Identity and Expression. I am SO excited that I just needed to get something down. I know we still have a long way to go, but I was not expecting to see this step so soon).